Steven Land fancy cotton shirts have not only developed a large following but many other shirt makers have tried to copy their styles and designs. The problem is that there can only be one Steven Land because they are the brand that makes the new styles first and other brands are trying to continually catch up to the leader. 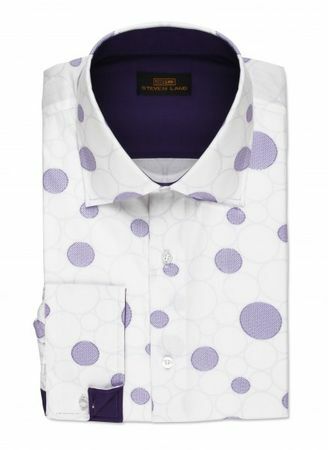 This white and purple cotton shirt features a circle pattern that no other brand out there has. It features stylish flip cuffs that that has a contrasting purple color allowing you a couple ways to wear this all cotton Steven Land Shirt.